It's here! It's here! And I love it! It feels like forever since I first sent in pages to Dawn for consideration. I'm really impressed with the accuracy of the colors in the printed book. Dawn collected Q&A from a bunch of artists but not all of the responses fit in the finished version. So Dawn is sharing Q&A's at her blog in the weeks ahead. Today is my lucky day so if you are curious you can read my Q&A about art and art journaling at Dawn's blog. These are my heartfelt responses to Dawn's questions. If you've been reading DY for long, you know that I believe 117% in the power of art journaling. The book is visually stunning, and I am choosing to contain myself and look through the just a few pages at a time. It's overwhelming in an amazing way. 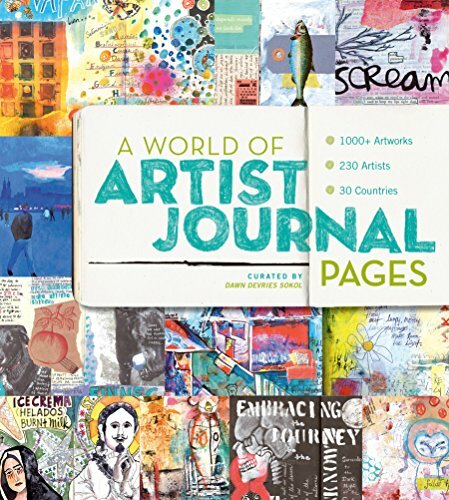 Artists from all over the world, joining together in their love for art journaling. Dawn is a keen curator and ace book designer deluxe and has gathered together in one space a wonderfully varied collection of pages. One of my pages that you'll find inside the book.